I just started helping my friend Leigh with his startup project, FreeMo (for Free Mobile), Leigh and I agreed to meet up at Lee's Brick House (LBH), a newly renovated bar in Juanita Beach, on a Saturday afternoon because Leigh needed food. I showed up and ordered a Mack & Jack's African Amber beer. I am on a budget so was not really interested in buying food, plus I'd already had lunch a bit earlier, so I abstained from ordering. Leigh and I had been to LBH a few weeks prior and had noted that they offered a French dip. 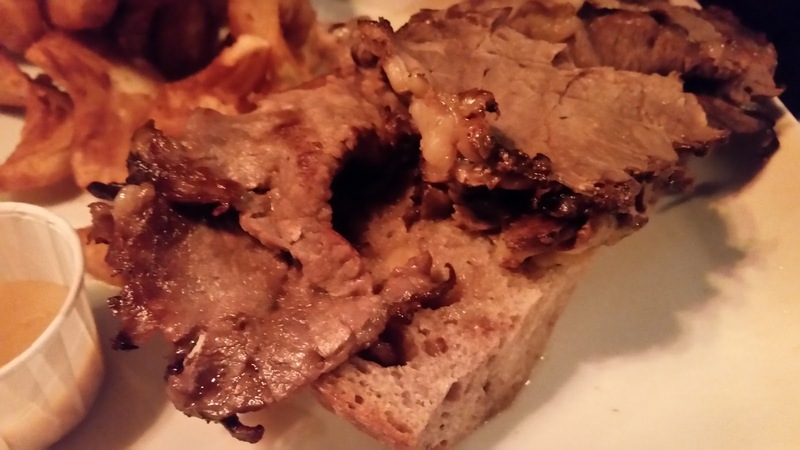 Sorry, I don't have the description, but this is an open-faced, wet Prime Rib dip. It sounded fancy and I think it's priced around $15. Leigh ordered the French dip, which caught me off guard. Had I ever just sat idly by while someone else enjoyed a delicious French dip? This was new. 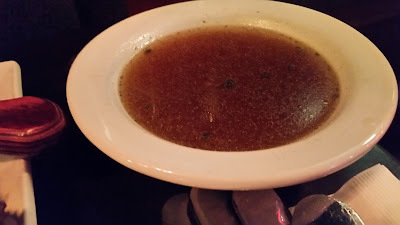 I offered the following to Leigh: that I could do something new and review the French dip through him (that he would eat it and I would coach him through the process of reviewing it). I thought it was funny and he accepted, so that's basically what you see below is pictures that I took of Leigh's food and the commentary (LOL) that Leigh made about his food as he ate it. Yes, he was gracious enough to share a bite or two with me for verification sake. And his son, Julian, was there as well, so there is commentary and feedback from him as well. So this winds up being my first ever three-person review where I am not the primary reviewer (but I do weigh in). This was a really fun and cost-efficient way for me to eat and review a French dip. Enjoy! 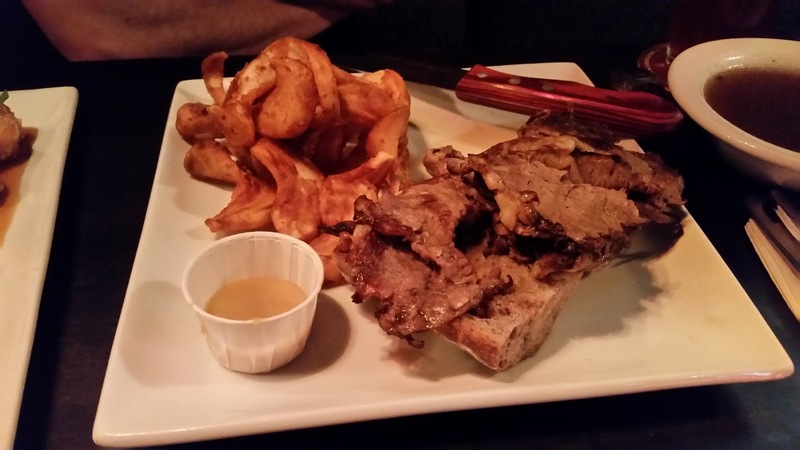 Here's their open-faced, wet french dip, served with fries and a side-sauce. Here is a close-up of the meat and sandwich. You can tell that the meat is done medium with no hint of rare. It did look pretty good and fancy, I must say but just wait. Here's the jus. They give you a pretty big quantity and you can see that there are "floating bits" in it, which is good but you can also see through it, which we would later discover is an issue. Here's their fries. These were pretty good. 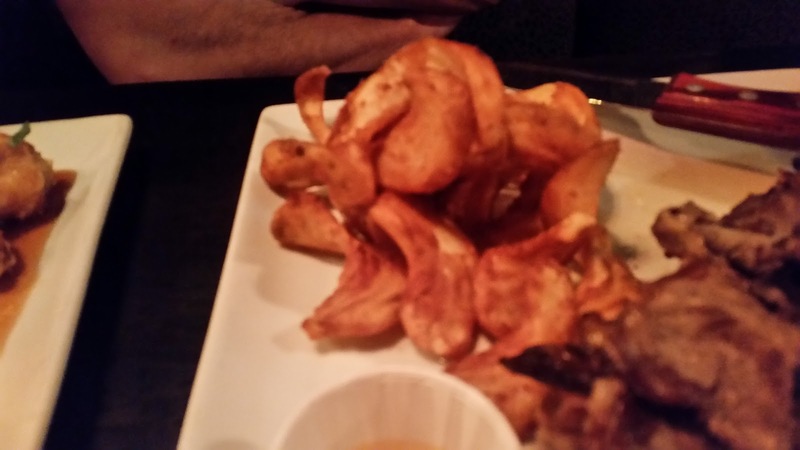 Another pic of their fries. 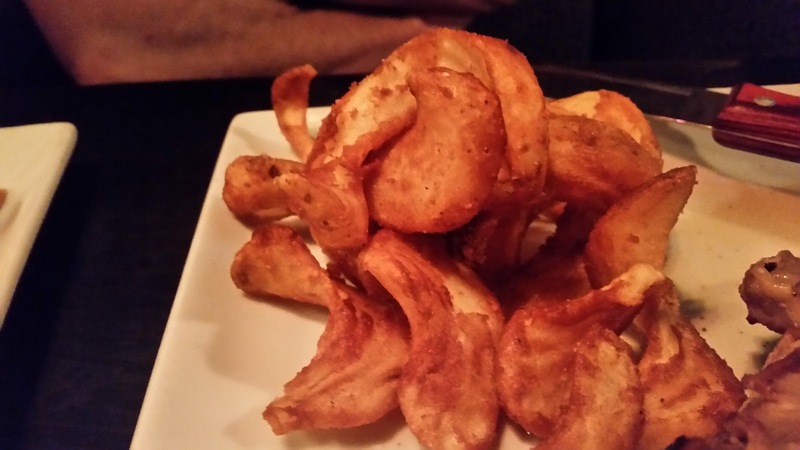 They are kind of like curly fries. Kind of fancy. Here's this side sauce that I originally thought was butter but Leigh liked it and said it was "mustardy" horseradish sauce. I think it added value and is unique. It gets points for this. Julian scored the jus between a 3.5 and 3.75, which is to say that he liked it. But I tasted the jus (even drank it) and score it a 1 of 5. So Julian must really like jus (even when it's not that great), so there is a lot of hope for this boy! 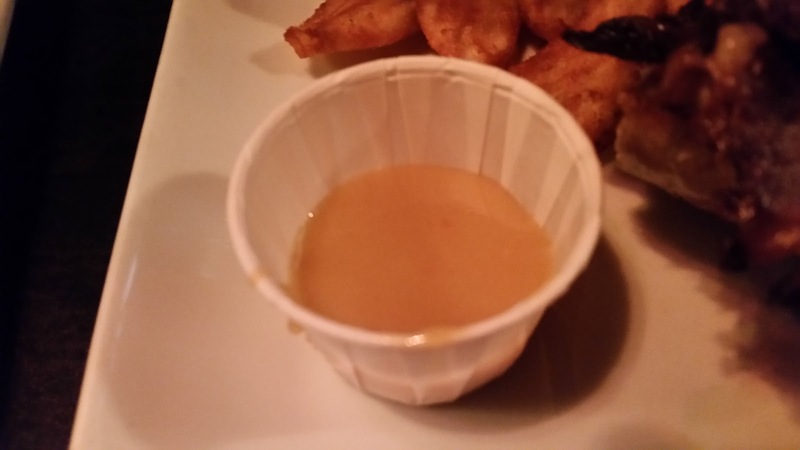 Leigh said the side sauce of "sweet, mustardy horseradish" was good but I didn't get a point-score out of him. I originally thought it was butter (it looked to me like butter in the low-light situation). I had a bite of the sandwich and gave it a 2 of 5. It was pretty flavorless and more than anything, I was 100% disappointed with the bread, which I score as a 1. It disappointed me in that it was soggy "wheat bread" (yes, wheat bread...at least it tasted like it) with SEEDS! (WTF?!?!?!) in it. NooooooooooooooOOOOOOOOOOoooooooo! (Thanks Dan Sims for the ooOOOooO thing...I think its fun and funny). Why seeds of all things? (Oh the humanity!) Since when do I want beef and seeds together? Not seeds!!!!!!!!!!!! And as for the jus, I score it as a 1. It was watery trash. So there's my second-hand review of this sandwich. I'll be sure to try other things on their menu and I hope that they can make their jus richer and get some nice French bread, perhaps with olives baked in. P.S. 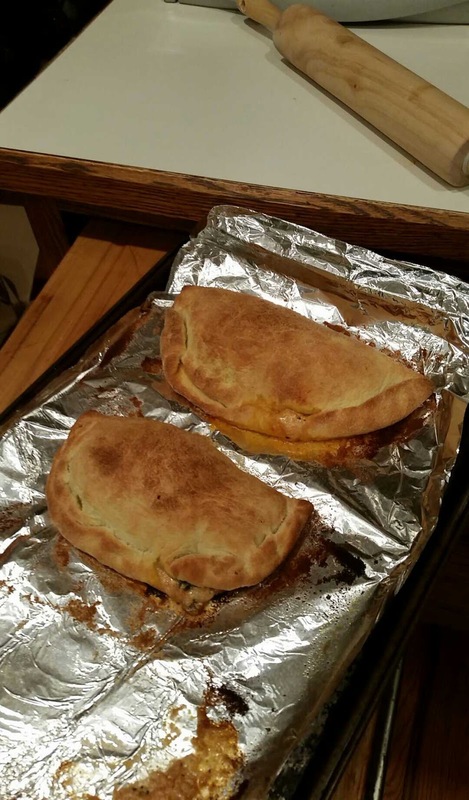 Later that evening, Jessica and I made some really good calzones from Blue Apron that had golden raisins and kale in them. Yummers!